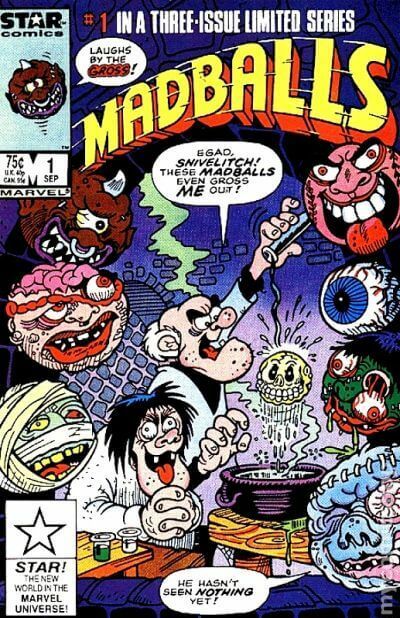 Madballs were a mid-80’s phenomenon that burned out pretty quickly. It was another entry in the “gross-out” category, alongside entries like Wacky Packages and Garbage Pail Kids. Unlike those sticker-based properties, Madballs were more-or-less gross-out versions of sports balls or other ball-shaped items. Well… that sounds kind of stupid when I type it out like that. As a kid, my mom didn’t really like me having any of these types of gross things. She still doesn’t approve. Being that the Baseball Guy (Screaming Meemie) wasn’t “TOO” gross, I was allowed to have one of those in some form and I could also have Oculus Orbus, because he was just an eyeball. God made eyeballs, and so the eyeball can’t be evil. Or so I convinced my mother. I don’t think I even had any of the original balls, just these action figure types. 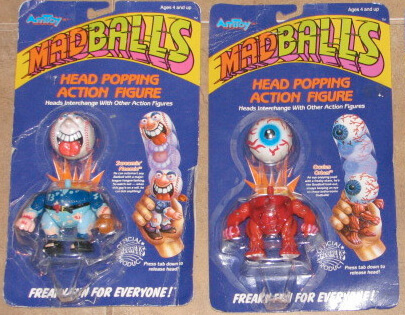 The Madballs themselves were a soft plastic, but still hard enough that they hurt if you beaned your brother in the face with one. After parent criticism, they started to be manufactured out of foam. The toys lasted only two series (plus bootlegs and knock-offs!) before the fad had run its course. Madballs also generated all sorts of other licensed materials like stickers and whatever. They also had a brief Marvel comic run and 2 direct-to-VHS tapes. Enough history! The Madballs are back, and you can currently pick them up in a few forms. There are smaller toy versions at Target next to the Grossery Gang (gross-out parodies of the Shopkins) in the Action Figure aisle made by Just Play toys, and there are more faithful (and slightly larger) reproductions made by Kidrobot. These are still made with foam, instead of the plastic, so you can freely hit your brother in the face with them. Kidrobot has also released a series of Licensed Madballs, based off of various Sci-fi and Horror properties. These are exclusive to Best Buy stores until the end of the year, and will run you $10 a ball. It’s a net and a cardboard tag. The illustration is neat, but the production artist or designer mirrored the actual Jason illustration so his teeth are on the wrong side. As a designer/production artist… that bothers me. It also seems that the net is not very protective. Imagine that! I saw some of them (pretty fresh out of the box) with chunks of foam missing already due to the minimal packaging. This is why you are buying this thing. It’s the fun Madball style applied to your favorite Horror or Sci-Fi guy! I only picked up Jason Voorhees, but I was very tempted to get the Nostromo crew member with facehugger. Jason here is wearing his trademark hockey goalie mask with a chunk missing, exposing his skeletal teeth underneath. It could either be his look from Friday the 13th Part VII: The New Blood, or perhaps Jason Goes to Hell: The Final Friday. There is also a nice worm crawling out of the eye hole. In fact, there are several worms crawling all over the back of his head, coming in and out of his decaying, green flesh. His brain is also exposed up on top. I’ve heard complaints about the paint, but honestly, it’s fine for a mass-market foam ball. The only thing that really bothered me was that the holes on the mask weren’t all filled in black. I took a sharpie and in approximately 30 seconds, had the holes all filled in with black. I usually wouldn’t buy a ball. This made me gladly buy a ball for more money than I would ever pay for a ball.